Gender-synchronized approaches recognize how both men and women shape and perpetuate gender norms in society and that working in an intentional and synchronized manner with both may be more effective than working with one or the other (51). Gender-synchronized approaches can occur simultaneously or sequentially within the same program or in coordination with other organizations. 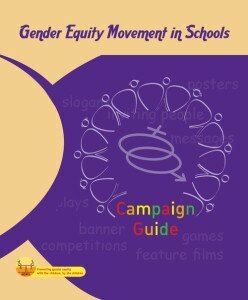 The Gender Equity Movement in Schools (GEMS) program in India aims to promote gender equality among adolescents in school settings by encouraging equal relationships between girls and boys, examining the social norms that define men’s and women’s roles, and questioning the use of violence. The school-based program uses extracurricular activities, role playing and games to explore these issues with both girls and boys (52). One of the areas of greatest change is around appropriate roles for women and men and girls and boys. Other key attitudinal and behavioral changes are increased support for a higher age at marriage for girls, greater male involvement in household work, increased opposition to gender discrimination, and improved responses to violence. A recent component to the project has included developing and testing an intervention to engage fathers of girls in two communities of Mumbai on issues related to their empowerment.